Microsoft has big plans for spreading Windows beyond phones, tablets, and PCs, and it's just started talking about the hardware options. 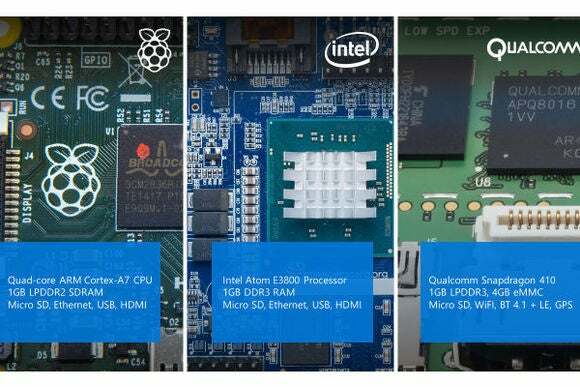 In a blog post, Microsoft revealed a few different chipsets that will support Windows 10 IoT, an initiative to bring Windows to new product categories such as connected homes, wearables, robots, and DIY computing kits. As Microsoft has already promised , the “Internet of Things” version of Windows will be free for “Makers” and device builders. Raspberry Pi's unenclosed computing kit, which has a Quad-core ARM Cortex A7 CPU, 1 GB of RAM, a microSD slot, Ethernet, USB, and HDMI. The original Pi was hugely popular among the DIY crowd as a cheap way to power robots, media centers, and all kinds of other cool stuff. Windows 10 support for Raspberry Pi 2 was announced last month. Intel's E3800 system-on-chip, which has an Atom processor, 1 GB of RAM, microSD support, Ethernet, USB, and HDMI. Intel says its ability to withstand a wide range of thermal conditions makes it ideal for digtial signage, ATMs, car dashboards, and industrial control systems. Microsoft is splitting Windows 10 IoT into three categories: “Small devices” will covers things like connected-home gateways that don't need a traditional software UI; “Mobile devices” includes a modern Windows interface and is aimed at point-of-sale systems; and “Industry devices” includes the full desktop shell and covers more powerful uses, such as robotics and specialty medical devices. Microsoft says Windows 10 IoT will launch this summer along with the regular version of Windows 10. Why this matters: Microsoft's Internet of Things push still feels somewhat conceptual, since we don't know what products will have Windows inside or how the “maker” community will get their hands on Windows 10. These announcements are basically just Microsoft showing that it wants to offer lots of options, and that it's still serious about getting Windows onto the next billion connected devices .